Saw the rheumatologist on December 10 for my routine checkup. Didn't even bother to mention it here because the nothing had really changed in terms of treatment for the past year. The doctor was only agreeing to see me every four months because I wanted to keep my records updated for Social Security disability, not because she thought such frequent visits were mandatory. My pain level was quite high, particularly since I had not recovered from a 48-hour visit to see my sister in a neighboring state on Thanksgiving. But it has been that high before with nothing new noted by the doctor. This time, though, she thought it was significant that I yelped every time she tried to flex my toes and that swelling was present in my feet which was not caused by hot weather; at the time of the appointment, the temperature outside was minus 4 degrees. The rheumatologist ordered x-rays of both feet and an MRI of the left one, which for the past nine years has consistently been more swollen than the right. The results of the MRI that was done in 2003 indicated edema, and the x-rays done in 2004 showed mild degeneration. These were not considered significant by this doctor when I became her patient. Honestly, my hips and neck have been bothering me much more than my feet the past couple of years. 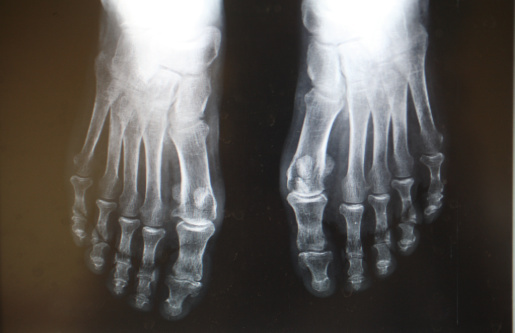 But I went ahead with the x-rays, figuring the feet would look the same as they did in 2004. The MRI was done three days later. Surprising news from the rheumatologist's office on Thursday: the MRI of my left foot revealed degenerative changes. Synovitis and bursitis in addition to the non-specific edema I already knew was there. I now have an appointment with the rheumatologist January 28 to discuss treatment, which may include prednisone or methotrexate. Interesting that my rheumatologist was so sure that my Sjogren's, which can cause autoimmune arthritis, was dormant that in 2010 she took me off the Imuran that the Mayo Clinic had prescribed in 2008 (she probably would have dismissed the Sjogren's diagnosis altogether had it not been confirmed by three rheumatologists in the past). She was blaming my worsening symptoms the past year on the fibromyalgia. While I know the fibromyalgia has been a significant player, it does NOT cause joint degeneration or the elevated c-reactive protein levels I've had for the past 15 years. So NOW she's going to take me seriously. I think some rheumatologists just don't believe the findings of previous experts until they find something wrong themselves. It's disgusting that the chronically ill often have to prove over and over that they are sick. It gets to the point where we actually get a little excited when they find something wrong with us, which is awful because it can mean treatment with very toxic medications. Nevertheless, part of me is a bit relieved that there is a reason (in addition to the fibromyalgia) for the intensity of the foot pain. And I said to the man who stood at the gate of the year: "Give me light that I may safely tread into the unknown!" And he replied: "Go into the darkness and put your hand into the Hand of God. Then shall be to you better than light and safer than a known way." So, I went forth, and finding the Hand of God, trod gladly into the night. And he led me towards the hills and the breaking day of the lone East. It takes a great deal of time to re-grow nerve, but it can be done and is worth the effort. In addition to the dietary suggestions, if you are diabetic, you can begin to reverse neuropathy if you keep your glucose levels below 140 at all times. I think I have managed to improve mine a bit. We thank you that are still God-with-us. Help us make the changes we must make; bring us to new places of openness and love toward you and the people around us; help us to overcome fears which keep us from fullness of life. Be with each of us . . . each one with unique needs - whether we are in need of physical or emotional healing, in need of direction or guidance, in need of courage or hope. As the frigid days of January and February draw near, help us to keep warm places alive with us, where we feel your peace. As we face the year ahead, we thank you for one another and your grace made known in Jesus Christ. If this is proven effective, it would be wonderful to have an option other than the ones I've already tried with no success. Bring justice to the peoples, O Beloved, and your mercy to all generations! May the people be known for mercy, rendering justice to the poor! Let their spirits soar as the eagle, let joy abide in every heart! May we heed the cry of the poor - the young and the old, helping to free all those in need, awakening the souls of oppression! May every heart open to your Love from sea to sea, from the Rivers of Life out to the universe! May fears that paralyze the people rise up from the depths into Your Light! For you heed the needy when they call, the poor and those who have no friend. You have compassion on the weak, the downtrodden, giving them strength and hope. From injustice and oppression, You redeem their life; and precious they are in your Heart. Come, let us offer our praise and prayers to the Beloved One who dwells in our hearts! "Let's assume for just a second that the account of Elizabeth and Mary's pregnancies is literally true. By all accounts, Mary was a young teenager at the time - awkward; hormones raging; body growing in fits and starts into adulthood, mind following reluctantly along. Any middle schooler will tell you - it's not easy being Mary. Then, on top of all that, she discovers that she's pregnant? By the Holy Spirit? The angel says, "don't be afraid," and at first Mary responds to this astounding news proudly, almost defiantly - "Here am I" - and then . . . she flees. And far away, too. From Galilee to the Judean hill country - 50 miles or more. Remember, she's just a kid. "According to the angel, Mary's cousin, Elizabeth, is also pregnant, even though she is quite elderly. Mary immediately bolts (no word of Joseph here) to be with her cousin. Just her greeting is enough to stir Elizabeth's womb, prompting her baby to kick (for the first time?). A bond is forged, and Mary stays for three months until just before Elizabeth's baby (john, who becomes herald of the Christ) is born. "Why? What did Mary find there that she didn't have at home? Elizabeth offered extravagant welcome and no judgment. Perhaps because of her own experience, she could relate to the young cousin on her doorstep. Whatever the case, Elizabeth clearly offered a safe space to Mary, a place of joy, affirmation and support. "Out of this safe space Mary is able to sing a song of praise, often called The Magnificat (Luke 1:46-55), that is one of the most stirring passages in all of scripture, simultaneously a song of thanksgiving and praise and a cry for justice. "So, if we want to empower others to both sing praises and call out for justice, let us learn from these two women: they pick up the clues that angels leave; they offer hospitality without judgment or recrimination; they do not hesitate to sing out in joy but link their song to cries for justice. 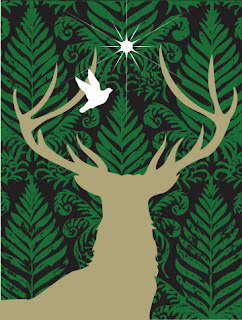 "When we are non-judgmental, when we are attentive to providing a supportive environment, when we (elders) allow young voices to find their place, and when we (of Mary's age) see out the counsel of older persons, we can discover settings across generations in which both poems of praise and cries of justice emerge in beauty." for something quite amazing to occur. Folks have come from miles around. and every town and village is astir. and is sure would be appealing if it were. but euphorious and gloriously grand. An extraordinary night, it's no wonder we're excited. Could there be a celebration close at hand? Oh it feels as if it really could be so! Yes, it's no ordinary night. There's something in the air tonight. like something must be brewing in the sky. there's much more to this night than meets the eye. There's a growing expectation of a coming revelation. We could use an explanation as to why. there's joy in our song. telling the world that the Savior is born. "Don't break your finger trying to make a point." "There are people and things in this world, and people are to be loved and things are to be used. And it is increasingly important that we love people and use things, for there is so much in our gadget-minded, consumer-oriented society that is encouraging us to love things and use people." - excerpt from William Sloane Coffin's book, "Credo"
They were on Jimmy Fallon on Tuesday night. Any repetitive motion or extended physical position gives me problems. This past Sunday, I stood at the front door of the church and for half an hour shook hands with everyone who came in. The rest of the day, I was even more exhausted than usual, falling asleep on the couch FOUR times, and then the muscle cramps kicked in. And the doctors wonder why we shy away from working out. What has Peter Jackson got in his pocketses? Movie Review: "The Hobbit: An Unexpected Journey"
The moment Tolkien fanatics have dreamed of has finally arrived: the first of a three-part adaptation of the beloved introduction to Middle Earth, "The Hobbit", arrived in theatres this weekend. I was lucky enough to view it early Saturday evening, and the lines at the theatre were long even though an ice storm was going on outside. Unlike the usual theatre scenario these days, this crowd was on its best behavior: no unruly kids running up and down the aisle, no chatting teens, no cell phones in use during the movie at all that I could see. We were all there to be totally absorbed in the experience and transported to a world that is fictional but, thanks to the "Lord of the Rings" trilogy, as familiar as though we were hobbits ourselves. J. R. R. Tolkien wrote "The Hobbit" in 1937 as a tale for his own children to read. It takes place some 60 years prior to the events described in "The Lord of the Rings". 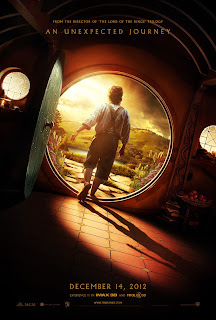 A hobbit resembles a man, but is smaller with hairy feet, loves to eat, and lives generally uneventfully in a tastefully decorated underground house. This is the story of one such hobbit who did what was considered unthinkable for his kind: he left home for an adventure. And not just any adventure: this had far-reaching implications, although he had absolutely no idea at the time. The hobbit in question, Bilbo Baggins, is visited one day by a wizard, Gandalf, whom he only vaguely remembers from childhood. Gandalf, unbeknownst to Bilbo, arranges for the hobbit to host 13 dwarves in his home for the evening, including their king, Thorin. The dwarves are about to embark on a mission to reclaim the treasure that was stolen from them by Smaug, a massive dragon. They want Bilbo to come with them to serve as a burglar. Despite his initial protestations, he finds himself abandoning all his creature comforts for reasons even he doesn't fully understand. "Unexpected Journey" introduces us to many creatures that populate the world Tolkien created: trolls, elves, goblins/orcs, massive wolves known as wargs, and even more massive eagles. Because elves and wizards have incredibly long life spans, some of the characters from "Lord of the Rings" also appear in this tale. Perhaps most importantly, we get to see how it is that Bilbo meets Gollum and acquires a magical ring. Because 3D movies give me headaches, I chose to see the 2D version. But even without the extra dimension, the look of the film is spectacular. Rivendell, home of the elves, was so beautiful it took my breath away. I grew up reading editions of "The Hobbit" containing the wonderful illustrations of Alan Lee. His influence is all over this movie. Bilbo's home in particular looked exactly as I had always pictured it in my head. And Thorin's map, the key to the journey, is straight from the book. There was also impressive attention to detail with the costumes and appearance of all the characters, even the ones who were fully computer generated. Gollum looks more realistic than ever before; I could practically swear I saw individual pores on his forehead. Because I have a cognitive problem differentiating between faces with similar features, I appreciated that each of the 13 dwarves had a unique look. The goblins/orcs and trolls were appropriately ugly, and the wargs appropriately fierce. I would be remiss if I didn't address the chief complaint I have been hearing about "The Hobbit": that it is too long. This first installment runs 169 minutes, yet only covers the first six chapters of a 19 chapter book. The chief reason for this is simple: back stories galore. Battles and important meetings that are only hinted at in the book or appear in appendices elsewhere are fully fleshed out and incorporated into the film version. So we actually get to see how Thorin lost his home and his gold, we see Gandalf's discussion of the Necromancer, and we see stone giants at play. This may be a bit much for those unfamiliar with the books, but it will delight those who have read over and over every word Tolkien has ever written and want to see it all on screen. There were two places where I thought the embellishment went on too long: the seemingly endless chase through the caverns of the goblin/orc king, and the story of Radagast. But I was rather pleased with the rest of the "bonus" story. The movie's PG-13 rating is appropriate. These are not Disney dwarves; these are fierce warriors who fight with swords. There is not excessive gore, but young kids might find it a tad scary, and they might not be willing to sit still for a three-hour movie. Those 12 and up who are already familiar with the story will be more likely to really get into it. "The Hobbit" An Unexpected Journey" is director/co-writer Peter Jackson's gift to the fans who have been clamoring for more ever since "Return of the King". It is only one course of a delicious meal; part two, "The Desolation of Smaug", doesn't come out for another year. But this appetizer is definitely one to savor. I am truly beside myself this time. I tried to ring a warning bell about this a decade ago. The disease has only gotten worse. But...you feel something different in the air across America tonight, don't you? People have had it and the outrage is loud and visible. I'm convinced the majority of Americans will now back strong gun control laws. And a better mental health care system. And perhaps a few are willing to look at the deeper issue of how this country officially sanctions violence as a means to an end. The NRA, for the first time ever, has gone silent. They've taken their Facebook page down. They know they can't show up in Newtown next week and stick it to the people there, like they usually do after one of these mass killings. Let's face it, the gun lobby tonight is on the ropes. Now is the time to act. We can't let this sad moment pass without a true response and a president willing to be a strong leader. CBS News reporting 27 dead at CT elementary school, many/mostly children. Only minutes away from pundits & politicians saying, "This isn't the time to talk about gun control." Really? When is that moment? The way to honor these dead children is to demand strict gun control, free mental health care, and an end to violence as public policy. Too soon to speak out about a gun-crazy nation? No, too late. At least THIRTY-ONE school shootings since Columbine. Just 18 hrs ago, those Republicans in the Michigan House rammed thru a bill making it LEGAL to carry a gun into a school or day care center. RT ‏@Marmel Hey, @BarackObama - you know all those nuts that fear you're going to take their guns? You can take their guns now. RT @mat: The gun lobby already hates Obama. I wish he'd give them an actual reason. In addition to his two handguns, the killer in CT this morning used an assault rifle called The Bushmaster. RT ‏@ScribeHard @Burnman @AwardsDaily I never read a headline that said "Dozens of Children Dead in Hand-to-Hand Combat." Guns. Facilitate. Mass. Killings. RT @JDillon777 @MMFlint Sad to see that 'Bowling for Columbine' has gone ignored. Perhaps you should have directed Batman, and maybe they'd listen. Hey NRA - why so quiet? Do you hear the rumble? The will of the people today? Coming your way. Think fast - the majority have had it. RT ‏@TimDempster @MMFlint It must be so infuriating knowing you warned against exactly this. Never fear, millions agree with you... Sadly mostly overseas! Medical Examiner: Most of the dead were killed w/ the Bushmaster assault rifle. Fires 30 rounds a pop. Most kids shot "more than once." Medical Examiner: If the dead children suffered "it was not for long." Ooooh. Some men didn't like that last tweet. So let me give u another:When's the last time u saw a woman walk in & spray a place w/ bullets? Pakistani children hold candlelight vigil for CT schoolkids: http://mmflint.me/UZUoE8 Ouch. "@jfb97n: let the victims b mourned stop pushing ur agenda." I'm done with "mourning." Time for action. To do less dishonors their deaths. Or try this one: http://mmflint.me/WfLtRu Very moving. NY Times: In past 6 months, more Americans killed by guns than COMBINED total of dead Yanks in Iraq, Afghan & all terrorist acts of past 25 years. If only the first victim, Adam Lanza's mother, had been a gun owner, she could have stopped this before it started. RT ‏@marlasuehale @MMFlint obviously that argument the NRA folks have been using doesn't work after all. RT @kazic284 @MMFlint Thanks for pointing out how dumb that logic is. People have been screaming, "If only the principal had a gun!" Missing the point. RT @mikelondoncan @MMFlint Number of homicides in Detroit, MI, 2010 - 310. Number in Windsor, ON, Canada, one mile away - 0. Same movies, video games. A country that officially sanctions horrific violence (invade Iraq, drones kill kids, death penalty) is surprised when a 20-yr old joins in? The long term solution to reducing gun deaths is to change our society from one of perpetual war and fear to one of peace and tolerance. The short term solution? A law immediately banning semi-automatic weapons & mega-clips. Must have license to own gun. Must pass mental exam. It's all violence & it's all connected. Why does this happen only in America? The answer is right in front of u. And it's not just the guns. "You cannot prevent the birds of sadness from passing over your head. But... you can prevent them making a nest in your hair." Compassion impels us to work tirelessly to alleviate the suffering of our fellow creatures, to dethrone ourselves from the centre of our world and put another there, and to honour the inviolable sanctity of every single human being, treating everybody, without exception, with absolute justice, equity and respect. It is also necessary in both public and private life to refrain consistently and empathically from inflicting pain. To act or speak violently out of spite, chauvinism or self-interest, to impoverish, exploit or deny basic rights to anybody, and to incite hatred by denigrating others—even our enemies—is a denial of our common humanity. We acknowledge that we have failed to live compassionately and that some have even increased the sum of human misery in the name of religion. • to cultivate an informed empathy with the suffering of all human beings—even those regarded as enemies. dogmatic, ideological and religious boundaries. Born of our deep interdependence, compassion is essential to human relationships and to a fulfilled humanity. It is the path to enlightenment, and indispensable to the creation of a just economy and a peaceful global community. "Believers know that while our values are embodied in tradition, our hopes are always located in change."